This is the 2nd in a series of articles written for the average bay fisherman who would like to know a little more about approaching a day of fishing. Let’s imagine you are arriving at the boat ramp on a Spring morning and the wind has been blowing since before you sat down for breakfast at that greasy spoon restaurant, a solid 18 knots! Not to worry that is a typical day down on the middle coast, you have to learn to adjust your tactics or have an empty fish box at the end of the day! A couple of the most important decisions you'll make is what type of bait you decide to buy and the way you will present it to the fish. Your presentation will be decided in great part by the weather and time of year! Shrimp and Popping cork is a great way to fish 8 or 9 months out of the year on windy days (Fall, Winter and Spring)! This style of fishing is used by only a few guides, it seems there is a contingent that has become opposed to teaching their customers how to cast, work the bait and set the hook…Not Me! Let me have a day of my clients casting over a day of anchoring up and casting for them! I have spent a lot of time working with the young and old alike, for example the 70 year old Yeager’s, yes the nephew of Chuck Yeager and also a war fighter pilot, were able to catch a whole mess of fish during an afternoon half day trip this Spring. I like my customers to fish, this is a great style of fishing, even for children! There are times when the anchor up guys catch more Redfish however they haven’t let their customers touch a rod other than to hand them the rod and reel when the fish is on. Now don’t get me wrong there are days when that is productive and I’m forced into that type of routine also, however the good catch on those days are limits of Reds and a couple of Drum maybe…Shrimp and Popping cork good days are limits of Reds, near limits of Trout with maybe a huge Trout RELEASED, a couple of Drum and a ton of fish in between! Corks – I predominantly use Cajun Thunders, however on deeper reefs Rattle Corks work well. On lighter wind days the old Mansfield Mauler could be and option too. I even save old corks for those days that the Redfish don’t want a lot of sound! Colors – I always start with two primary colors, pink and chartreuse. Most of the time you will find Redfish like one and not the other and the same for Trout…however they may be hitting both or you can select the color depending on when you are fishing an area more conducive to the fish you expect to catch. Leader – Easy, I use only 20# fluorocarbon! The leader length when fishing the flats should be just above the grass you are drifting over, I keep varying lengths available to change on the fly. Leader lengths are increased when fishing the deeper bay which I seldom do using this style of fishing. Hooks - #2 or #4 laser sharp trebles depending on the shrimp size. I have found smaller to medium size shrimp work better than the big ones. The larger shrimp do not work under a popping cork, you might as well save them as an appetizer with the corn battered Trout! Knots – Use an improved clinch knot from the line to the cork. Do not use a snap swivel, it makes the cork lay over! I use a loop knot to the bottom of the cork for quick changing leader lengths and loop knots to the treble hook for more realistic movement. Accessories - Beads are a VERY important part and sometimes not a part of the rig all together! The general rule of thumb is to start with small beads on most of the rigs and at least one rig without a bead. Really make sure your buddy’s is fishing the bait properly before ruling out any package! Sometimes going to a larger bead when the water is very muddy or stirred up makes a difference! Now that the terminal gear has been laid out it is time to talk about presentation! The cast should be made in an arch and as the cork is floating down flip the bail on the reel over by hand to make a softer presentation – pop the cork once or twice immediately after it hits the water…did I say immediately…I meant it…I believe that is a major key to being effective! I start out the day by popping the cork (learn to pop it WITHOUT moving it toward the boat) in about 5 second intervals on windy days pop it more! Remember that even on windy days Redfish may not like a lot of popping so alternate presentation to find what works. If you follow the actions listed above you will get fish in the box! You'll also want to learn to stop the bait within a couple of feet if you don't feel the weight of the fish and pop the cork if it comes back to the surface, you don’t want to keep reeling the bait out of the strike zone! Remember the retrieve is a steady reeling, if you let slack get in then try to catch up you will not even come close to realizing your potential catch at the end of the day! In closing remember that nothing about fishing is set in stone, pay attention, vary your approach and find what works! If fishing gets slow after a couple of good catches I find that the angler gets a little pumped and is working the cork faster than before the hook ups! In an additional note let’s not over look popping cork and piggies on the occasional early summer day! 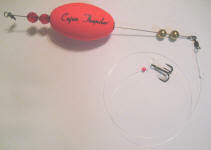 Use the same popping cork rig but instead of a treble use an appropriate size kahle hook! This can be an incredible way to fish when nobody else has had a good bite, keep the bait fresh, they don’t last long casting under a cork (expensive but effective)! I hope you’ve enjoyed this article and remember if you don’t eat it release it and try to release all big Trout…get a picture it will last longer, save some for the kids! I see weekend fisherman that spend a lot of time on the water not really adapting to the methods that professionals use to catch fish consistently. If you are a lure aficionado or tournament angler then this article is not for you, sorry! I see a lot of authors writing about how fast to work your chartreuse, pumpkin seed, gold flakey, curly tailed fish whackers or to find sandy, shelly, grassy flats drop offs…so I thought I’d write something most of you could really use to catch fish more consistently! 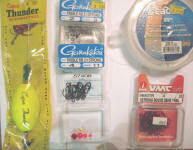 I will go over the four or really five major types of fishing bait that we use as fishing guides. The first way to fish although many guides have given up this method because it requires more effort to train the customers is shrimp and popping cork (SPC). The Second is anchoring up and fishing the sand pockets located in the flats. The third is anchoring up and fishing guts and isolated deep water areas locked within the flats systems. The four and fifth way are fishing with Piggies (piggy perch not pin perch) and Croaker. Now that I have the described the types of fishing we choose, let me explain when we use them…this is the most important part! Wind, is the most important indicator of what method we will use. I personally pray for wind so we can use the most popular, successful and frequently engaged method – Shrimp and popping cork. SPC can be used for the longest time frame during the year! The SPC method also allows my customers more of a chance to do the fishing themselves instead of feeling all they do is reel in the fish! When the wind is blowing 15 knots or more this is the best option to catch fish! This is only an option in the Fall, Winter and Spring as the bait fish mature and others invade the flats system this methods becomes unfeasible, also the larger fish don’t seem to gobble up the shrimp as readily. If you use the SPC method in the summer on the big bay the fish seem to range in the 14” and under category which will leave you hungry at the end of the day! If there is no wind…put the shrimp and popping cork aside…seriously…you’ve got to get used to fishing the sand pockets (Pot Holes) and put your time in doing it! This is a very important tip, don’t try to revert back to drift fishing with shrimp and popping cork. It will take time to have confidence to do this type of fishing but it is worth the effort because nothing is more effective on light wind or windless day. This type of fishing can be done with live mullet, cut mullet, dead shrimp, live shrimp, pin perch, piggy perch, ballyhoo or crabs. I like to use live bait predominantly when there is little wind however I will almost always mix it up with cut bait too just to add scent to the water. You can use everything from a jig head to a Carolina rig with various weights, we also add a water corks at times to get extra casting distance which is very important on the days without wind! The next style of fishing is low tide fishing. Hopefully you’ve studied your map or taken note when you have been crossing he flats on normal days, if you did you will have areas in the back of your mind to try when these conditions present themselves. Be very careful if you don’t know the area well, maybe watch another boat enter that area and wait your turn to try it. Remember some lanes into the deeper guts in the flats system aren’t even as wide as your boat. We use the anchor up method of fishing on these days too, however the big difference in choosing bait. Since a low tide day can either be windy or calm the way I determine my primary bait is based on this rule; windy days use any type of bait that will create a scent on calm days use live bait. The simple analysis is that windy days the water is murky and hard to see through and calm days the fish can actually see what they inhale from quite a distance! Now the forth and fifth method are very similar and I will combine them; Piggies and Croaker. The reason I made them two different styles is because of the areas we use them, Croaker seem to stay effective way longer in the area north and south of Port Aransas such as the Laguna to the South and San Antonio Bay to the north. In the Rockport and Port Aransas areas Croaker mature faster to be used as bait than Piggies, but when Piggies start coming in look out! Piggies and Croaker are held very fondly by fishing guides because when you are on fish and the time is right you can’t find a hotter trout bait, not without saying Redfish will tear’em up too! We fish these types of bait at the rigs, grass edges off the deeper bay islands, reefs, Intercoastal waterway and sand pockets in the flats. The preferred rig is a size appropriate kahle hook tied to a 20# leader attached with a swivel or knot to the main line. The time of year we use this bait is from the about the middle of May into September, at that time the bait is predominantly too large and the schools start migrating. Now that you know why and when we fish certain baits we can start talking about the various techniques that make a difference in presenting it to our prey, but that we have to save that for the next article! After all I do have to make some time to fish instead of write! With all kidding aside I want to spend time covering each of these methods in depth as they all have their place in our fishing arsenal! I hope you’ve enjoyed this article and remember if you don’t eat it release it and try to release all big Trout…get a picture it will last longer, save some for the kids! Interesting, fascinating game, presents itself - fishing simulator . There is enormous amount of varied fish In game, each of which possesses its behaviour. own instruments for fishing of fish - a fishing rod, bob, and others. This game is developed as office-game. It can be played in full-screen or window mode. Also you can minimize game into system tray which will give warning you about biting. The Play has an excellent playing design. The Beautiful behaviour of water will not leave you indifferent to her. It consists of 28 locations with nice graphic and music. Now you not it is necessary long to collect their own belongings to go fishing. Now you simply it is necessary to start this play! When Wahoo hits your lure at 60 miles an hour and runs your 30 lbs test line for a few spurts of 100 to150 yards , you have discovered an allure that no other fish will give you. The Wahoo or &#40;Acanthocybium Solanderi&#41; is lean, sleek, torpedo looking fish that may be confused with a king mackerel to someone who has never seen one before. The mackerel however does not run like a Wahoo nor does it display the classic vertical bands that extend its lateral lines. The Wahoo are also normally found in deeper blue water zones where tuna are often running, as is the common case. Few argue that there is a better tasting fish than the Wahoo.It can be argued that there isn&#39;t a fish in the ocean that has whiter meat than a Wahoo and the texture of the meat makes you want to eat all of it as Sashimi, Sushi or very lightly seared. It is a crime to cook this fish for longer than a few minutes, as there is no need to alter its texture from its right out of the water texture. It hits a Texas peak in May and can last all year. Wahoo grow rapidly from birth often growing to five feet in range. The older ones seem to be rounder at the girth, the bigger ones often reaching above 70&#43; pounds. On average in the Texas waters Wahoo are caught between 20 and 80 pounds and a lot come from 12-50 miles offshore. In Texas Wahoo is not sought out commercially and even difficult to hook one on rod-and-reel due to their hard mouth and razor sharp teeth. But, Most boats manage with extremely sharp hooks and lures. Hence, they are often lost as often as landed. When it comes down to it, Wahoo are not under much fishing pressure and no regulations to date have been imposed or size limits. To catch a Wahoo, a fisherman will need over 100 lb. steel test leader and it needs to be about 3 to 4 feet in length. It is often that you will see the marks of the leader wire along the sides of the Wahoo body after catching one. On a few occasions I have witnessed fishermen wanting to use monofilament test leader only to be amazed at the mono shreds left from the hoos razor like teeth. To cach them, our local fishermen will recommend Rapala And Yozuri lures and deepwater divers anywhere in the 3 to 5 inches range as with anything saltwater the bigger the lure the bigger the fish remember a weighted lure is best. Your luck with the lure will vary depending on what the Wahoo are eating in the area you are fishing. In Texas, we troll for Wahooâ€™s although I have on occasion caught a few bottom fishing for grouper. When the word is out that they are around, weÂ´ve rarely failed to catch them Most often trolling is the key on most charter boats a trolling trip for wahoo can cost big bucks so choose your charter very well make sure they have caught wahoo at least more than 3 times as this will benefit your luck at possibly getting and landing one on the deck and remember there is no limit on wahoo. Check out the following link to read the Texashuntfish.com December 2006 Newsletter! Hunt Hard. Fish Smart. Explore Texas. at El Budster and then hit video presentation. If you have any questions, please email or call 631-525-7987. Thanks again and good luck fishing! The gulf coast of Florida offers some of the best grouper fishing around. The Gulf has fairly calm water most of the year &#40;except for our new 11 month recent hurricane season&#41;. The gear is pretty simple: a fairly stout rod, I say fairly stout because you don’t want your rod too stiff because this will effect the action it has on the bait…more on this later. I use 40lb line on the reel with a 100lb shock leader, and about an 8/0 hook. I like to use live bait for grouper fishing but some prefer jigs, spoons, and even heavy grade trolling lures. After gear, guests, and boat are ready we need to catch some bait. I like to use the “junk” fish that you catch when bottom fishing with smaller rigs. Blue runners, sand perch, lizard fish, etc… Grouper are not real picky eaters when it comes to live bait. Yes, they do have favorites like anything else that eats, but the fish mentioned above will work great. I start my day with a piece of a large squid, about the size of you open hand is usually enough. I like to use large squid because it is tougher and stays on the hook better. Check you local fish market for availability. We head out and stop around the 45’ area and start looking for our bait. Most of the time there are no clear signs of where the bait is, you just have to keep trying till you have some luck. The bait we are looking for is holding on the bottom most of the time unless you can find some sardines in the area, then try a Sabaki rig or something similar. Cut your squid into small strips and send it to the bottom and see if any small bait fish are going cooperate with your plans. Unless you have a favorite area to catch bait, you might have to move around till you start getting bites. We usually move about 300-500 feet each move till the bait starts biting. After you get a couple dozen baitfish in the livewell head on out to your fishing area. Ours is around the 100 foot mark and is a series of GPS marks in a 3-5 mile square area. If we don’t get a bite in 20-30 minutes or so we will move on to another GPS mark in the area, &#40;and no, I won’t give you my GPS #’s&#41;…sorry! This article is continued in http://www.thefishingfool.com/fishin...ing-part-2.php. I admit, I have an obsession; it¡¦s to catch the most billfish in the Gulf of Mexico, not to mention the largest Blue Marlin on the Texas Coast. After spending 27 years as a Professional Rodeo Cowboy the competitive attitude is hard shake and has been spilled over to my other passion, Billfishing! I have spent all of my life hunting and fishing around the world, from the Atlantic Ocean to the far reaches of the South Pacific! I believe in a competitive edge in all sports, working harder at fishing, better information about an area, being more alert, rigging the best lures and baits, having better technology onboard and just being lucky. Luck sometimes just happens or sometimes people make it happen by doing all the right things, it¡¦s called being prepared! Now don¡¦t get me wrong fishing is enjoyable, relaxing and exhilarating but being organized and prepared for an offshore trip will add to the rewards of your success. First, before I head offshore my information search starts with weather. This can dictate not only where I¡¦m going to fish but also if I¡¦m able to going fishing period. The general rule of thumb is if the wind is 10 knots or less it¡¦s going to be a beautiful day, anything up to 17 knots is fishable but a little bumpy. Beware of the wind switching direction during the day as the seas are likely to be confused or bumpy and may stay that way until the direction stabilizes. Second, I check water temperature and structure. This is where Hilton¡¦s charts come into the picture; currents develop along the edge of the temperature breaks and when it¡¦s over structure it is the key element in finding bait, rips and weed lines which are instrumental in locating many species of offshore game fish such as Wahoo, Tuna, Dolphin, Kingfish, Ling and of course Billfish just to name a few. Hilton¡¦s charts are the best and most current source of offshore structural information on the market! Weekend warriors and tournament fisherman take note, the first one to these areas are more likely to cash in! Third, I look at saltwater bulletin boards for postings in my fishing area, talk to other offshore Charter Captains and even look over the catch of local head boats. This information can help you draw a pattern of the bite, bait location and bait movement. This type of information is particularly valuable if you are fishing a new area or fish only on weekends. Forth, Develop a fishing plan. It is important that you know where you want to fish and you may even want to create GPS waypoints along possible temperature breaks, especially those over structure. Creating a plan will help you optimize your fishing time and everyone knows that the only way to catch fish is to wet a hook. I would suggest also creating a backup plan that may overlap the primary plan. Only execute the backup plan if you seem to be completely off the fish pattern and have other information such as Channel 68 VHF radio reports of fish activity. Fifth, Create a checklist that can be used every time you go offshore fishing. The checklist should contain line items pertaining to engine maintenance, fishing equipment, bait and groceries. Fishing offshore is not a sport to take lightly, have the self-discipline to use the checklist on every trip because there are no stores in the middle of the gulf and even more important there are no mechanic shops. Of course there is a lot more to catching fish offshore than the five steps above, however if you practice self-discipline and pay attention to detail you will have a lot more time to fish when you are on the water, not to mention you and your crew will be a lot more comfortable. Also remember to conserve our resources and only keep what you will eat! Although fishing days are few due to weather conditions you still may expect good fishing when Mother Nature allows. Warm water currents from the Yucatan peninsula are carrying the first pelagic fish &#40;Bill Fish&#41; back to the Texas coast. These fish can be found at places such as the Offshore Floating Oil Rigs, East Breaks but will soon approach the closer waters around structures like the Baker and Big Southern. When targeting these early fish look for structure on or near a warm current edge, these edges generally are associated with weedline and rips. I like to use Ballyhoo for this type of fishing, I will also slow troll smaller live baits in the Ballyhoo spread. When trolling in open water use darker skirt colors since Blue Marlin are the first Billfish to show up and that is their color of preference with the exception of the Mold Craft Standard Wide Range in Brown, Pink and White. Remember to always troll one lure or bait back on the sixth wave or further, this will get reaction strikes from fish that drifted back from the baits trolled near the boat. Closer to shore the species that started to show up a few months earlier such as Wahoo and Dolphin are still hanging around over structures like Baker, Hospital, Aransas Banks and Big Southern as well as the fish like Amberjack, Grouper, Tuna and Shark that remained there all year. The most effective way to troll for Wahoo, Tuna and Dolphin is similar to Blue Marlin trolling with the exception of adding a few smaller lures to the spread such as Billy Bait’s Mini Turbo Slammer and use lighter and brighter colors, Wahoo do however like the darker lures and plugs such as the Repala’s. I look for Wahoo, Tuna and Dolphin on or near warm water currents located on or near a good structure or Oil Rigs, as always Keep Ballyhoo handy if lures aren’t turning the fish on. March is still a good month for bottom fishing due to light fishing pressure offshore. The fish you should be targeting are Amberjack, Grouper, and Shark. I look for these fish on rocks and rigs in at least 150’ of water, when you mark bait balls on your sounder and see a few larger marks around them you have found your spot and may want to throw a buoy incase you drift off it. Amberjack like small live baits like Piggy Perch which the kids can catch at the docks or Bar Jacks caught on the rigs, Amberjacks may be suspend so refer to the larger marks on the sounder to find the associated depth of the fish and drop your line accordingly. Grouper are bottom dwellers and like to eat anything from dead squid to live piggy perch, use heavy tackle and a 400# mono leader with at least a 10oz weight as these fish grab the bait and swim back into their hiding spot. When fishing for Shark use dead or almost dead bloody bait with a steel or cable leader and fish three water columns, on top with a balloon, suspended with light or no weight and near the bottom. Always set the clicker on the reel and use very light drag let the fish take the bait for 10 seconds and set the hook. Remember offshore anglers can look forward to Snapper season opening again in late April.